19° Few showers, easing later. The Dockers deal the Eagles a major belting in Derby XXXVI, running out huge victors to claim vital percentage and fortify their position in the top8. Pav finishes with eight and the Jakovich Medal! Duffield takes the mark 55m out from goal and can take his time with time expiring. The siren sounds as his kick falls short and the Dockers win by a massive 65 points! We could have a firstever Western Derby final come September. That would be HUGE! BEHIND DOCKERSPriddis simply lies over the ball and makes no attempt, although it would have been hard to with about three players on top of him. Barlow takes the free, but hits the post. Three of the Eagles final four games will be extremely tough with matches against Geelong next week and Collingwood and Hawthorn in rounds 22 and 23. Not going to be easy. GOAL EAGLESHurn with a lovely snap out of the congestion from the stoppage and the Eagles surpass their lowest ever score at Patersons Stadium. GOAL DOCKERSFyfe drills a lace-out pass inside 50 to Mundy on the chest. Classy work. From just inside the arc, he launches a long bomb that sails all the way home for a sublime major! 11 minutes of game time to go and the Fremantle supporters are enjoying every second, the margin currently at 64 points. Dawson has been subbed out of the game and Roberton has been activated for the Dockers. Pavlich now holds the record for the most goals kicked by a Docker in a Western Derby with eight to his name. BEHIND EAGLESMcPhee is holding Cox out of the contest inside attacking 50 and Big Cox wins the free. He is off target with a wayward shot at goal. BEHIND DOCKERSMundy swings a shot at goal but can't work it back enough - one behind. GOAL DOCKERSDe Boer pumps the ball inside 50 and Pavlich attacks it ferociously, leaps over the pack to bring down a sensational grab! He goes back and hammers home number eight from 40! The final quarter is underway and Pavlich has already booted a personal best against the West Coast Eagles with seven majors. Can he add another three for a fairytale 10? An eightgoal quarter for the Dockers and they have stormed out to a game-high 58-point lead as the siren sounds for 3QT. What a performance! Sheppard was subbed out of the game earlier in this term nursing his right thigh after coping a knock in the first term. Swift is on. GOAL DOCKERSIt is a Dockers' onslaught! 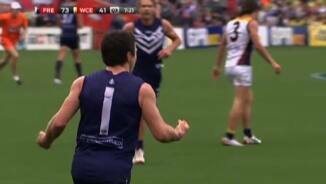 Matthew Pavlich slips his opponent, crumbs the ball, sprints away and rolls home number seven! Incredible scenes! Dockers lead by 58 points! 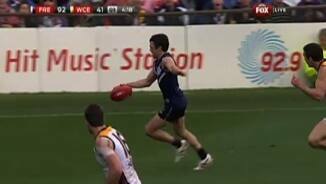 BEHIND DOCKERSWalters receives the handball from Pav, steadies but misses from 40m out directly in front. GOAL DOCKERSHayden Ballantyne with a piece of brilliance. Pavlich brings the ball to ground, Hayden roves it wonderfully, sidesteps a tackle, runs to the boundary and works it back for his third! BEHIND DOCKERSDuffield down the wing drives the ball out in front of Pearce who is running toward goal and he takes the mark, almost plays on but decides against it. He misses from dead in front. GOAL DOCKERSThe Dockers win the centre clearance through Fyfe, Walters finds the footy and finds a way through the traffic, he unwinds from 45 and the Dockers have all the answers! Amazing! GOAL DOCKERSGaff takes the mark and takes a half a step, the ump calls play on, Duffield tackles him, the ball falls to Fyfe who passes inside 50 to Ballantyne and he plays and goals! Ouch. GOAL EAGLESDarling pumps it to the danger spot, Hams leaps for the mark, it spills to the ground, he roves it wonderfully and snaps it through and the Eagles grab consecutive majors... Game on. GOAL EAGLESLynch takes the leading mark 50m out from goal hard up against the boundary line. He can drive it home from here. He goes back, lets it rip with a beauty and steers it through! GOAL DOCKERSMayne pumps the pass to the hot spot, it falls out the back to Pavlich who can do no wrong! He snaps it home from tight in the pocket for number six! He leads the Coleman Medal race. GOAL EAGLESHill bumps Dawson off the ball, gathers, dishes it off to Naitanui who quickly pops the ball on to his boot and dribbles it through end over end for a nice goal. GOAL DOCKERSPavlich roves the ball out of the stoppage, swings it on to his boot from 35, it sails high and bounces through out of the reach of Hurn! Dockers lead by 44 points. BEHIND DOCKERSWalters swings the shot at goal from 45, it bounces, bounces and dribbles through for a behind. GOAL EAGLESDarling lays a strong tackle on Fyfe anf Fyfe makes no attempt to get rid of the ball so the umpire calls it - holding the footy. Darling, from 40, nurses it through. Finally. GOAL DOCKERSMzungu makes the most of his opportunity as the ball spills to the back of the pack, the Dockers swarm on the Eagles' defenders and Mzungu toes the ball through for a goal! Another goal to the Dockers will take the margin out beyond 40 points and make it near impossible for the Eagles to fight their way back in to the contest. GOAL DOCKERSPavlich finds De Boer inside 50 and then he shorts the pass to Ballantyne who takes the mark 25 out from the sticks. Hayden makes no mistake and takes the margin out to 37 points. BEHIND EAGLESA rushed behind for the Eagles to start the third quarter - their 11th minor score of the day. Third quarter underway and the Eagles have their work cut out today. 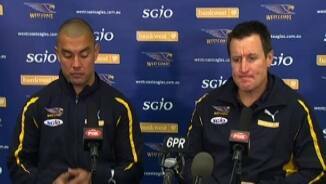 There's a lot of footy to go, but if they don't get a move on then they can kiss the four points goodbye. Half time and the Dockers added 3.4 to their score while the Eagles added just five behinds and Fremantle hold a commanding 32point lead at the main break. GOAL DOCKERSMundy with the pass to Pavlich and he is caught over the shoulder by McKenzie and the umpire calls for the free kick late. From right on the 50m arc, he steers it home! Stunning! BEHIND EAGLESLynch pumps it to the goal-line and has the ball punched over for another behind. Eagles are 1.10. BEHIND EAGLESYet another minor score to the Eagles as McGinnity snaps it over his shoulder under pressure. BEHIND DOCKERSHill has a snap at goal from the right pocket, it floats through but it was touched off the boot. BEHIND EAGLESLnych snaps at goal from 45 and McPhee takes no chances and thumps the ball over the line from 10m out. The Eagles have still yet to register their second goal, 20 minutes in to the second quarter. The rain has begun to tumble and this could be a matchwinning lead for the Dockers come half time. BEHIND DOCKERSGriffen unwinds from outside the arc, the ball bounces and bounces but McKenzie dives to save the goal. BEHIND DOCKERSFyfe shoots at goal but has the ball punched over the line for a behind. GOAL DOCKERSPearce drives the kick to full-forward, Pavlich has his opponent beat, he takes the chest mark in the square, plays on rams home his third! Dockers lead by 26 points! Beautiful! BEHIND DOCKERSBarlow crashes the pack, gathers the footy but sprays the shot wide from 35. BEHIND EAGLESAnother behind to the Eagles through Masten and that is 1.7 for the game so far. BEHIND EAGLESThe Dockers turn the ball over by foot, Hill pounces, snaps at goal but Crowley gets back to fist it over the line. The tackle count is 2916 in favour of the Dockers and they have all the momentum. The Eagles just can't mount an attack at the moment. The pressure from the Dockers and their ability to get back and help out their defence is sublime. The Eagles are in a bit of a hole. GOAL DOCKERSWalters clunks the mark on the wing and then gets 50 as Waters holds him too long after the grab. He lays it of to Pearce who unwinds from just inside the arc and guides it home! De Boer tries to trip up Kerr deep in the Eagles' defense and he will go on report for that foolish act. Underway in the second quarter and the Dockers mean business this afternoon, taking it right up to the Eagles in that first term. Kerr leads the possession count with 10. The siren sounds to end an intriguing opening quarter and the Dockers restrict the Eagles to just one solitary goal and take a 15point lead in to the break. BEHIND EAGLESMcPharlin escorts the ball over the line for a rushed behind to the Eagles. GOAL DOCKERSBallantyne intercepts Selwood's back pass, hits it over to Pavlich running forward, he shoots it over to Walters and he charges in and slams home the goal! That hurts! GOAL DOCKERSThe ball flies out to Mzungu from the congestion and he slams ball on boot and rides home the goal. Magical! Dockers out by 10 points. 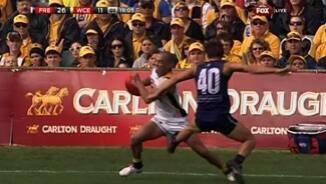 BEHIND EAGLESPriddis fires the handball inside 50 to Shuey who is caught around the neck by Crowley and wins the free. He sprays the shot left for the Eagles' fourth behind. 102 clearance in favour of the Dockers and they have started the stronger of the two teams in Derby 36. BEHIND EAGLESHurn receives the handball from Hams, unloads from the paint but drags the shot wide left. BEHIND EAGLESMasten with a long kick in to the goal-square but McPharlin gets back to push it over the line. BEHIND DOCKERSPavlich gathers, works on to his right boot and swings through a behind. He has Freo's entire score to date. BEHIND EAGLESWaters with a brilliant pass deep in to the left forward pocket and he spots Gaff 25m out. On a 70 degree angle right on the boundary, he strikes the post. Aggressive and attacking football from both sides and the pressure and intensity is high to start this match. GOAL EAGLESMcPharlin is on report after charging in with his elbow and catching Darling high. The free is awarded to Darling, he unwinds from outside the 50m arc and hammers it home! GOAL DOCKERSMayne dishes it off to Hill who drives the pass out in front of Pavlich who stretches to take the mark, has already broken free, runs in and rams home the goal! He has two. BEHIND DOCKERSPearce to Barlow who swings the kick in to the right forward pocket and Pavlich, once again, slides in to take the chest mark. He hits the shot across the face. GOAL DOCKERSBarlow drives the pass to the hot spot and to the advantage side of Pavlich who takes the chest grab directly in front of the sticks. He nails the goal for the perfect start for Freo. Waters catches Ballantyne over the shoulder and in the backwhatever you like - and Hayden will line up from 40m out on a tight angle. He fails to score. No late changes for either team and the subs are Roberton for the Dockers and Swift for the Eagles. Derby XXXVI is underway in Perth in cool, damp conditions as the rain begins to fall. Welcome to Patersons Stadium for the second Derby of the season. Plenty at stake for both clubs: the Eagles still in contention for a top4 spot, the Dockers playing to stay in the hunt for finals.